These two concepts are used in an economy to measure the prosperity of a nation. The definition of income differs from person to person or from entity to entity. In economic terms income means the total of wages, salary, profits, rent, interest and many other gains over a period of time. National income means the total value of the total output of a nation, it includes all goods and services produced over a period of one year. It is the sum total of the market price of all goods and services produced in a financial year. In it, the value of all goods and services produced in a nation over a period of time is added. Another name of this method is a value-added method. GDP by income method is the sum of salary and wages, rent, interest, and profit. It includes expenditure on all items, it includes services, investment, goods, and import-export. 2) GDP at factor cost. It is the sum total of net value added by all producers in Nation. It is the total of the net output of the economy during the financial year. Nominal GDP is measured GDP on the basis of current market price. If GDP is calculated on the basis of fixed market price over a period of time. It is an index of price changes in goods and services, it includes GDP. It is the total of the flow of all goods and services at market value produced during a year in a country, it includes net income of abroad. Disposable income is the total amount of money that households used to spend on goods and services and saving after paying income taxes. It is also known as a Disposable personal income. It is an important indicator to measure the overall economy. It is a net amount of a household or an individual available to spend on needs, to invest, save after paying income taxes. National income is the total value of the total output of a country, it includes all goods and services produced in one year. 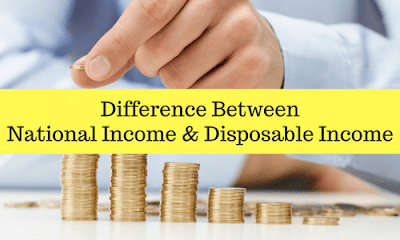 Disposable income is the amount available to a household for spending, investing, and saving after paying income tax. Input method, Output method, income method. It is calculated considering tax.